Donate | Crockett Foundation - Tag In & Help Out! We Need Your Help!A single donation can make a big difference! Paying the veterinary bills and food costs of those beautiful dogs who were active duty soldiers, retired Military Canines. There’s no retirement pension in place to cover the normal costs of living for these heroes. Paying for the training of certified Service Dogs and Emotional Support Dogs for Veterans. Training one dog to become certified costs around $15,000. Improving the lives of Veterans who are working toward mental and emotional stability due to Post Traumatic Stress Disorder (PTSD). We carefully choose veterans’ charitable organizations that operate with integrity and we support their missions. Change the life of a veteran or service animal in need! At the Crockett Foundation, we feel so blessed, and we’re grateful for where we are today. Truly able to help those looking to donate to veterans. 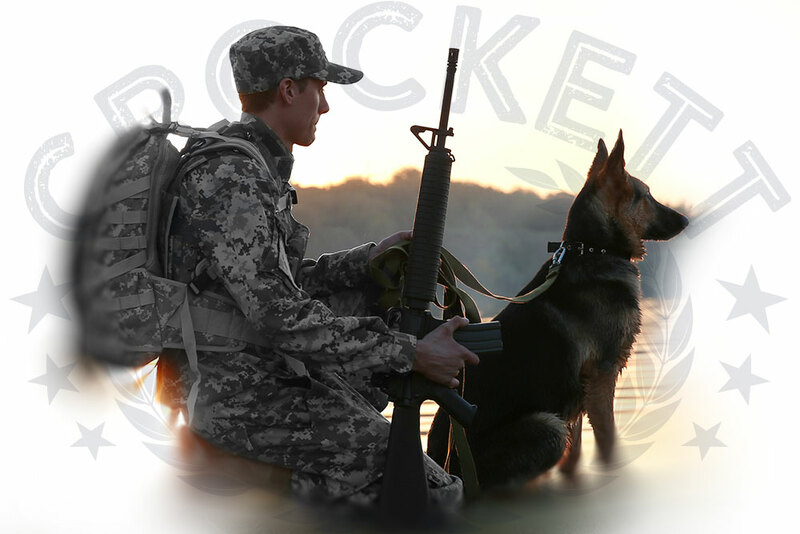 We actively carry the torch that was lit so many years ago by Jim Crockett Sr., using the family name and notoriety to help US Veterans and retired Military Service Dogs in need. When you donate to veterans it’s nice to know that your generous contribution is put to good use. We do just that! The Crockett Foundation is here to help you make donations in exciting ways. Veterans and civilians alike would like to adopt Military Canines and love them during their retirement years. However, there’s no financial support for veterinary bills or food costs inherent to their lives post-service. Imagine the veterinary bills for an aging dog! Imagine being a Veteran or civilian who loves their dog and is responsible for his buddy’s vet bills in his/her old age. That’s an expensive bill to cover! We help ease that burden and help you say “Thank you for your service” when you donate to veterans through us. We are on a mission and actively seeking organizations that train Service Dogs and Emotional Support Dogs for Veterans in need. Because it can take many months or years to train these dogs. depending on their current age and abilities and the particular needs of the Veteran. It’s more expensive than simply owning and caring for a dog. It’s approximately $15,000 per dog, and the Crockett Foundation aims to help cover those costs. The Crockett Foundation finds the best veteran charities. That directly support our missions, and we make sure your donations go directly to supporting veterans. In that way, we’re helping the Veteran and we’re also helping the retired Military Service dog. It’s a beautiful thing! Jim Crockett, Sr. would be so proud that his legacy is helping to fund the best veteran charities. Thank you, from up above, for setting up your family to be in a position to help in this way. We’re having fun and we’re so proud to be carrying on your legacy. Doing good things for our community and the heroes who help protect it. The Crockett Foundation is a tax-exempt 501c3 non-profit organization. Your generous monthly or one-time donation is tax deductible.